Undercutting can be performed for a number of reasons, for example to interrupt the growth of the plants or to loosen the trees / plants to make harvesting them easier later on. 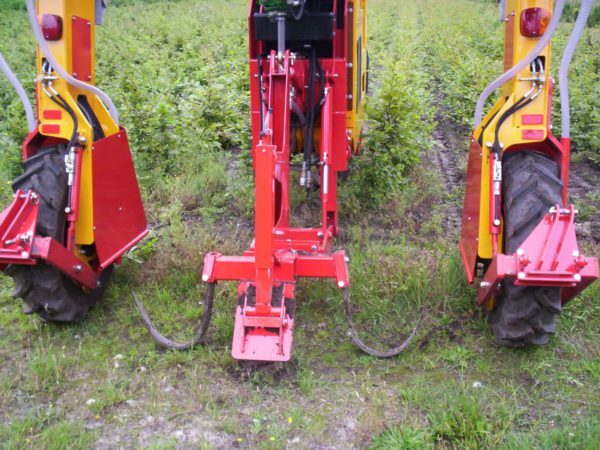 The Damcon HOS undercutting machine is available in a single and double execution and is mounted to the middle lifting device of the high clearance tractor. When purchasing the undercutting machine you can choose between three U-blades of 30, 40 and 50 cm. The blade scan be provided with lifting tines. Those lifting tines are made for loosening the trees to make harvesting/collecting them more easily. Harvesting trees with our high clearance tractors can be performed trough a harvesting machine which is provided with a shaking blade. Trees are loosened by the shaking blade and makes it fairly easy to harvest/collect the trees by hand. 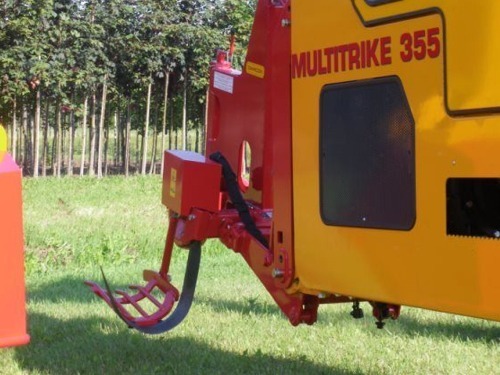 The harvesting machine is mounted in the middle lifting device and is hydraulic driven. The HOS-1 harvesting machine is suitable for blades of 30, 40 and 50 cm, furthermore the machine is provided with a grill which fits to the mounted blade.